CIPE Home Exchanges and Programs Topics 【Report】Delegation of King Fahd University of Petroleum & Minerals visits UEC. 【Report】Delegation of King Fahd University of Petroleum & Minerals visits UEC. 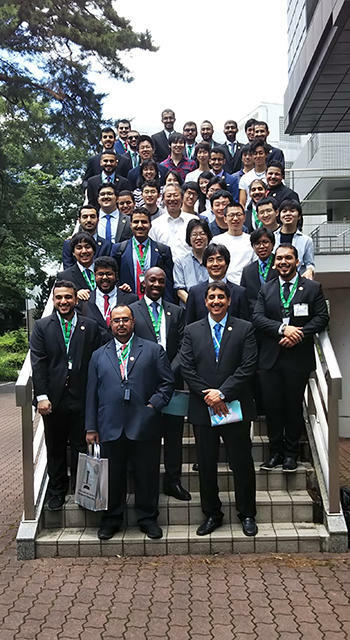 A delegation of 20 students and 4 supervisors of King Fahd University of Petroleum & Minerals（KFUPM）from Saudi Arabia visited UEC on 16 June, 2018 under the study tour conducted by Japan International Cooperation Center (JICE) . This tour is originally started based on the request of KFUPM through the Royal Embassy of Saudi Arabia Cultural Office, Japan. This program aims to visit some Japanese Universities with cutting-edge research and education in science and technology, develop their own expertise and broaden their horizons in a range of specialty fields through discussions and cultural exchanges with researchers and students of the host institutions. After a courtesy call on Prof. Fukuda and an introductory presentation about UEC, they visited Institute for Laser Science and Prof. Yokoi Laboratory, Department of Mechanical and Intelligent Systems Engineering, and eagerly listened to the presentation of research theme with demonstrations. [Updated] The Number of International Students 【Report】Student Delegation of University of Electronic Science and Technology of China visits UEC.